When the diagnostic system is switched from the normal mode to the check mode, all the DTCs and freeze frame data recorded in the normal mode will be erased. So before switching modes, always check the DTCs and freeze frame data, and note them down. 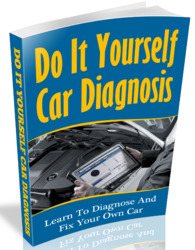 (a) Checking DTCs using the OBD II scan tool or hand-held tester. 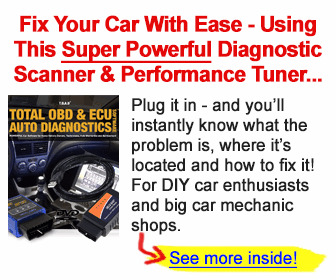 Connect the OBD II scan tool or hand-held tester to DLC3. Turn the ignition switch to the ON position. Use the OBD II scan tool or hand-held tester to check the DTCs and freeze frame data and note them down (For operating instructions, see the OBD II scan tool's instruction book). See page 05-372 to confirm the details of the DTCs. When simulating symptoms with an OBD II scan tool (excluding hand-held tester) to check the DTCs, use the normal mode. For codes on the DTCs chart subject to "2 trip detection logic", turn the ignition switch off after the symptom is simulated once. Then repeat the simulation process again. When the problem has been simulated twice, the MIL is indicated on the instrument panel and DTCs are recorded in the ECM. 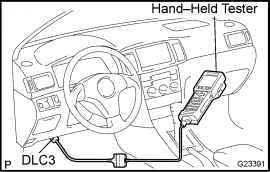 (1) Connect the OBD II scan tool or hand-held tester to the DLC3. (2) Turn the ignition switch to the ON position. (1) Disconnecting the battery terminal or remove the EFI and ETCS fuses from the engine room J/B for 60 seconds or more.